The UK government has published a new white paper with a 1-month consultation on its post-Brexit approach to trade, including its plans on trade for development. With the virtues of trade under scrutiny, the paper helpfully re-endorses the UK’s role in championing free trade and supporting the rules-based system of the World Trade Organisation. On development, the Government emphasised that its “first priority” is “continuity in our trading arrangements with developing countries.” The current EU regime offers duty and quota free access to the 49 poorest countries; reduced tariffs for two further groups (22 countries); and “reciprocal but asymmetrical” Economic Partnership Agreements (EPAs) or other trade agreements (FTAs) with a further 57 (see ODI’s excellent table here and abbreviated below). The Government has already committed to “improve access…for the world’s poorest post-Brexit”—and the white paper seeks views on where the improvement would maximise development impact. If the UK just copied the EU’s regime, access would effectively be worsened due to the extra layer of checks for those imports passing through the EU. The UK‘s first priority should be to be to replace the EU’s Economic Partnership Agreements with something better. EPAs are trade deals with developing countries which (allegedly to comply with WTO rules) require “reciprocal” reductions in trade barriers to EU producers. Whilst more open trade is desirable for both parties, EPAs can expose developing countries’ markets to competition from the economically advanced economies before they are ready, and artificially skew their imports away from the best supplier and towards EU products. They often take years to agree and, importantly, are now hampering important intra-regional trade (in particular, in the East African Community). 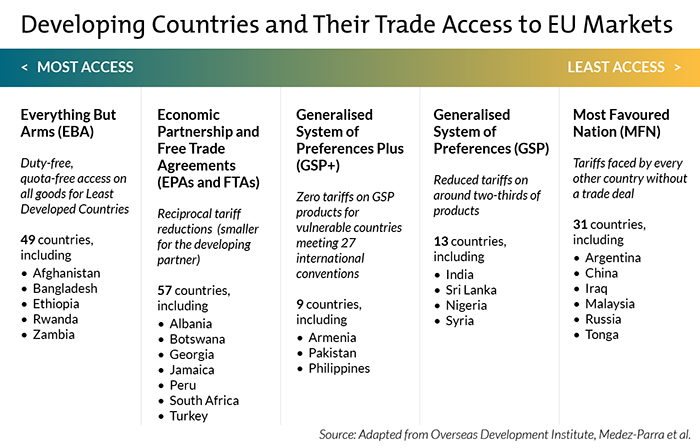 The UK should take a simpler and more development-friendly approach to achieve its ambition with a single “Generalised System of Preferences,” which removes tariffs and quotas for a wider range of developing countries without requiring the reciprocal approach in EPAs. This would be good for the UK—providing lower prices to UK consumers and businesses, and good for development by having a simple, open regime for developing country producers. The loss of reciprocity could mean that some UK exporters could face some new tariffs to these countries, but exports to these countries are tiny (less than 0.005 percent of the UK’s total). Importantly, replacing EPAs with a broader Generalised System of Preferences would also remove the risk that the EU’s trade deals may not apply after Brexit. This new approach would require technical and political investment. To comply with WTO rules, the UK would need to define an “objective” criteria to establish who would benefit from those preferences. Max Mendez-Parra at ODI has laid out one such scheme. And it would mean diplomatic and political effort to persuade WTO members that this is reasonable position to take—at a time when the UK will have a range of other asks of the international trading system. Particular effort would need to be made with those countries which might face more competition as the UK offers poorer countries more access. There’s a great deal to support in the UK’s trade white paper: fulsome support for free trade; the rules-based international system; a commitment to transparency and openness—and a consultation on how the UK’s approach to trade can maximise development impact. We have argued the UK can be a leader on trade for development. The Government responded with a welcome ambition to improve access for poor countries. This ambition could be pushed into the long grass, after Brexit, perhaps in even in the next five-year Parliament from 2022. But that would mean a decade’s delay and a substantial missed opportunity. The Development Secretary Priti Patel said in her recent conference speech that “Britain can reassert itself as a global beacon for free trade, enterprise and free market” and the Trade Secretary Liam Fox calls this is a once in a lifetime opportunity. We agree. After Brexit, the UK can not only reproduce but improve on EU rules for market access for developing countries. The government should start by establishing a broad and geneous preference scheme to succeed the EU’s Economic Partnership Agreements.